Nova Events: November 29 – January 2 | Dexless, Maplestory Guides and More! Get ready to unlock great rewards! Nova-themed events are available now! Level up, earn rewards, change your name, and more! Create a new character and earn free gifts for leveling up between Lv. 140 and Lv. 200 and completing missions! One new character per account (excluding Zero characters) can gain some useful items for every few levels they gain within this leveling window. To begin, accept the ‘[Nova] Test out your skills in the Breakthrough Nova Challenge!’ quest from the star event notifier on the left side of the screen. Complete the assigned mission for each level range, and receive gift boxes at Lv. 140, Lv. 150, Lv. 160, Lv. 170, Lv. 175, Lv. 180, Lv. 185, Lv. 190, and Lv. 200. Get your hands on Breakthrough Potions which give you an entire level if you use them soon! If you use them after the next leveling milestone, you’ll only receive half the EXP needed to gain the next level. Other items you’ll receive include Miracle Circulators, Selective 4 Slot Coupons, Maple Point Coupons, Spell Traces, Character Slot Expansion Coupon, and more! Breakthrough Potion 140: Untradeable, 7-day duration. Use between Lv. 140 and Lv. 149 to gain one whole level. If used after Lv. 149, you’ll only receive half of the EXP needed to gain a level. Miracle Circulator Coupon: Untradeable, 7-day duration. Use the coupon to receive a 3-day Miracle Circulator. Cadena Mask Coupon: Untradeable, 7-day duration. Use the coupon to receive a Cadena Mask that gives the following stats for 30 days: STR/DEX/INT/LUK +5, Weapon ATT/Magic ATT +3, MaxHP/MaxMP + 300. Selective 4 Slot Coupon: Untradeable, 7-day duration. Use to expand an inventory tab of your choice by 4 slots. Cannot be used on Storage. Breakthrough Potion 150: Untradeable, 7-day duration. Use between Lv. 150 and Lv. 159 to gain one whole level. If used after Lv. 159, you’ll only receive half of the EXP needed to gain a level. 1,000 Maple Point Coupon: Untradeable, 7-day duration. Use the coupon to receive 1,000 Maple Points. Hyper Teleport Rock (7 Day) Coupon: Untradeable, 7-day duration. Use the coupon to receive a 7-day Hyper Teleport Rock. Breakthrough Potion 160: Untradeable, 7-day duration. Use between Lv. 160 and Lv. 169 to gain one whole level. If used after Lv. 169, you’ll only receive half of the EXP needed to gain a level. Cassandra Coin: Untradeable. Use to receive 50 million mesos. Special Medal of Honor x5 Coupon: Untradeable, 7-day duration. Use the coupon to receive five Special Medal of Honor items. Breakthrough Potion 170: Untradeable, 7-day duration. Use between Lv. 170 and Lv. 179 to gain one whole level. If used after Lv. 179, you’ll only receive half of the EXP needed to gain a level. 3,000 Maple Point Coupon: Untradeable, 7-day duration. Use the coupon to receive 3,000 Maple Points. Non-Reboot worlds: Cadena Black Secondary Weapon: Untradeable when equipped. Can be received once per world. Reboot world: Black Transmitter Coupon: 7-day duration. Use the coupon to receive a Cadena Black Secondary Weapon. Can be received once per world. Breakthrough Damage Skin: Untradeable, 7-day duration. Nova Buff (x10): Untradeable. Use to receive a 30-minute buff that increases Attack Speed, Speed, and Jump; and gives Weapon ATT/Magic ATT +30. 2x EXP Coupon (x3): Untradeable, 7-day duration. Use to receive 2x EXP for 15 minutes. Breakthrough Potion 180: Untradeable, 7-day duration. Use between Lv. 180 and Lv. 189 to gain one whole level. If used after Lv. 189, you’ll only receive half of the EXP needed to gain a level. Gaga Coin: Untradeable. Use to receive 100 million mesos. Master Craftsman's Cube x5 Coupon: Untradeable, 7-day duration. Use the coupon to receive five Master Craftsman's Cubes. Star Force 12-Star Enhancement: Untradeable, 7-day duration. Breakthrough Potion 190: Untradeable, 7-day duration. Use between Lv. 190 and Lv. 199 to gain one whole level. If used after Lv. 199, you’ll only receive half of the EXP needed to gain a level. 3,000 Maple Point Coupon (x2): Untradeable, 7-day duration. Use each coupon to receive 3,000 Maple Points. Inkwell Coin: Untradeable. 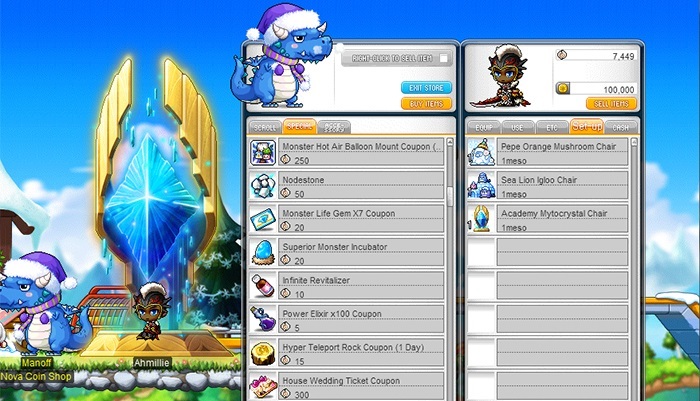 Use to receive 200 million mesos. 10,000 Maple Point Coupon: Untradeable, 7-day duration. Use the coupon to receive 10,000 Maple Points. Character Slot Expansion Coupon: Untradeable, 7-day duration. Use the coupon to receive one additional character slot in the given world. Your account may hold a maximum of 42 character slots per server world. Do you want to change the names of characters on your account? 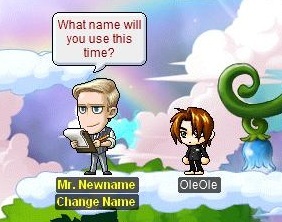 With the Character Name Change option, you will be able to instantly change your character's name by talking to NPC Mr. Newname, located in the Event Hall. Players Lv. 33 and above can begin by speaking to Mr. Newname to learn about the process. You need a Character Name Change Coupon to change your name. During the event period, you can purchase a single Character Name Change Coupon from the Nova Coin Shop. The Character Name Change Coupon can also be purchased from the Cash Shop for 15,000 NX. Take your coupon to the Event Hall and speak to Mr. Newname. Select 'Change Character Name'. Read the list of rules and if you're sure you want to change your name, click 'Continue'. For security purposes, you will be asked to enter your PIC. Enter the new name you'd like for your character and click 'Change'. Your new name will be applied instantly after you log out and log back in to MapleStory—no need to wait for it to be processed during a maintenance. You can only change your character's name once per week. Be sure to give your new name some thought! Hunt monsters within your level range (20 levels below and 20 levels above) and they may drop Nova Boxes! Open the box to receive one Nova Coin to spend in the Nova Coin Shop. You can collect 60 Nova Coins per day through the boxes. Earn Nova Coins through other events and take them to the Nova Coin Shop to exchange them for rewards! The Nova Coin Shop can be accessed through the star event notifier on the left side of the screen. There are lots of exciting items available in the shop, including the Cosmos Ring Coupon and accompanying Cosmos Atom and Cosmos Ring Cube. The coupon gives a Cosmos Ring with Rare potential. When a Cadena or Illium character uses it, the following bonus durational stats will be granted to the Cosmos Ring for 30 days: STR/DEX/INT/LUK +10, Weapon ATT/Magic ATT +5. You can also get a Clean Slate Scroll 10%, Epic Potential Scroll 50%, Special Medal of Honor, or Incredible Chaos Scroll of Goodness 60%. Other items available for purchase include Potential Stamps, damage skins, chairs and mounts, Nodestones, 8-slot bags, Character Slot Expansion Coupon, and more! 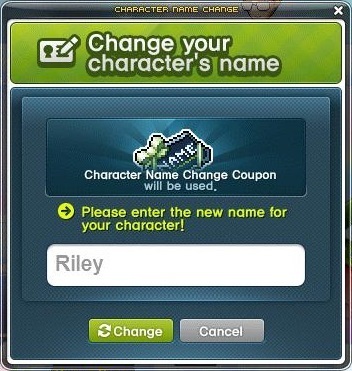 If you want to change your character’s name, you can purchase a Character Name Change Coupon from the Nova Coin Shop! Use this to change your character’s name one time! After selecting your new name, log out and then back in to see the new name take effect. Nova Sugar Coin Box: Untradeable. Earn various amount of Nova Coins depending on the number of times you have opened this box. Cadena Legendary AbsoLab Weapon Box: Open the box to receive a Cadena Absolab Weapon with two random lines of Legendary Potential. Fairy Flight Full Package Coupon: Use to receive each of the Fairy Flight Full Package Coupons. Complete specific requirements each day to earn a reward box full of great items! To begin, accept the quest from the star event notifier on the left side of the screen. There are four timed stages, each corresponding with a mission. You need to complete the specific mission within the time limit in order to complete the stage and receive a reward box. You can’t complete the next stage until you clear the previous stage, so make sure to go in order! Missions include activating runes, participating in certain battles, and more. If you complete all four stages, you can receive four different reward boxes per day! The boxes contain such goodies as Maple Reward Points, mesos, cash items, and Master Craftsman’s Cubes! One character per world can receive the reward box. 50 Reward Points: Untradeable, 1-day duration. Use to receive 50 Maple Reward Points. Non-Reboot worlds: Traveling Merchant (1-day): Untradeable, 1-day duration. Non-Reboot worlds: Owl of Minerva: Untradeable, 3-day duration. 200 Reward Points: Untradeable, 1-day duration. Use to receive 200 Maple Reward Points. Super Megaphone: Untradeable, 3-day duration. Miracle Circulator: Untradeable, 1-day duration. Master Craftsman's Cube: Untradeable, 1-day duration. Keep participating each day and earn enough daily reward boxes to unlock a cumulative box! Depending on how many daily boxes you receive during the event period, you will be able to access bigger and better cumulative boxes. The boxes contain such goodies as Red Cubes, cash items, Maple Reward Points, and AbsoLabs weapons! One character per world can receive the reward box. Royal Hair Coupon: Untradeable, 3-day duration. Non-Reboot worlds: Golden Apple (x5): Untradeable, 1-day duration. 10,000 Reward Points: Untradeable, 1-day duration. Use to receive 10,000 Maple Reward Points. Red Cube (x6): Untradeable, 3-day duration. 12 Star Unique AbsoLab Weapon: You will receive a weapon based on your character's job (not available to Zero, Cadena, Illium jobs). Untradeable.